“The Fabulous Golden Cake” created by ceramic artist Eric Abraham for Foothills Art Center’s 25th anniversary. Golden History Museum & Park, City of Golden Collection. Foothills Art Center celebrates their 50th anniversary this year. Incorporated on April 19, 1968, the fledgling community art center soon made what was the old First Presbyterian Church at 809 Fifteenth Street their permanent home (the church held their last service there in 1958). A grand opening was held on August 3, 1968. The first exhibition featured Bill and Dorothy Harmsen’s “Western Americana Collection.” Shortly after opening, the center was robbed. Twelve paintings, some firearms, and other collectibles went missing. Everyone assumed insurance would cover loses; however, the fledgling institution did not have any. Fortunately, everything was recovered. One of their first community events was as a co-sponsor of the annual Golden Sidewalk Watercolor Art Show. 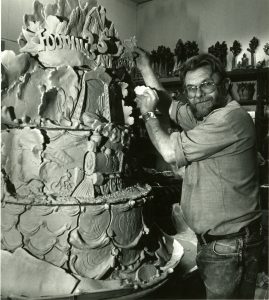 Over the years FAC gained a solid reputation, hosting the juried Rocky Mountain National Watermedia Exhibition (started in 1974), the North American Sculpture Exhibition (started 1979), and Holiday Art Market (started in 1975). Much has changed over the years, thanks to dedicated volunteers and forward-thinking leadership. They included volunteer director, Den Galbraith, and then professional executive directors Marian Metsopoulos and Dr. Carol Dickinson, among many others. Marian passed a few months ago. She was easily one of the greatest change-makers to date. She paid off the mortgages on both buildings, put their buildings on the national registry, raised the money for a major renovation, and formalized many policies (1972-1991). Fifty years later Foothills Art Center is still a hub for the arts. If you’ve not visited recently, maybe it’s time. Discover artifacts related to Foothills Art Center here. If you have an epic event to share or know a legendary person to feature, let me know.